Dream in Green (DIG) launched The Dream in Green® Academy (The Academy) as a platform that promotes collaboration with other community organizations to introduce environmental education programs to K-12 schools in South Florida. The Academy builds on the success of the Green Schools Challenge (GSC), DIG’s flagship program, by leveraging its established framework for delivering educational programming to elementary, middle and high school students. The Green Schools Challenge is a whole-system program that engages students in hands-on activities to save energy and water at school and teaches them about the links between natural resources, climate change and community sustainability. Participants receive a guidebook with educational activities focused on the following monthly topics: energy efficiency and conservation, waste reduction and recycling, water quality and conservation, alternative transportation, green living (buildings and careers), and food efficiency. It serves as the entry level program of The Academy in which participants learn the basics of sustainability and build the foundation for a green school. Thanks to the Batchelor Foundation and Kirk Foundation, Dream in Green will award $14,000 in the form of grants to Green Teams participating in The Academy. Visit our page for more information and guidelines. If your school would like a DIG staff member to conduct a site visit and present our programs to your teachers/staff/administration please make your request by filling out this form. If your school is enrolled in The Academy watch the training video to get you started with program implementation. Once a teacher has finished viewing the video please email the Program Manager (alexandra@dreamingreen.org) in order to receive your school’s points. 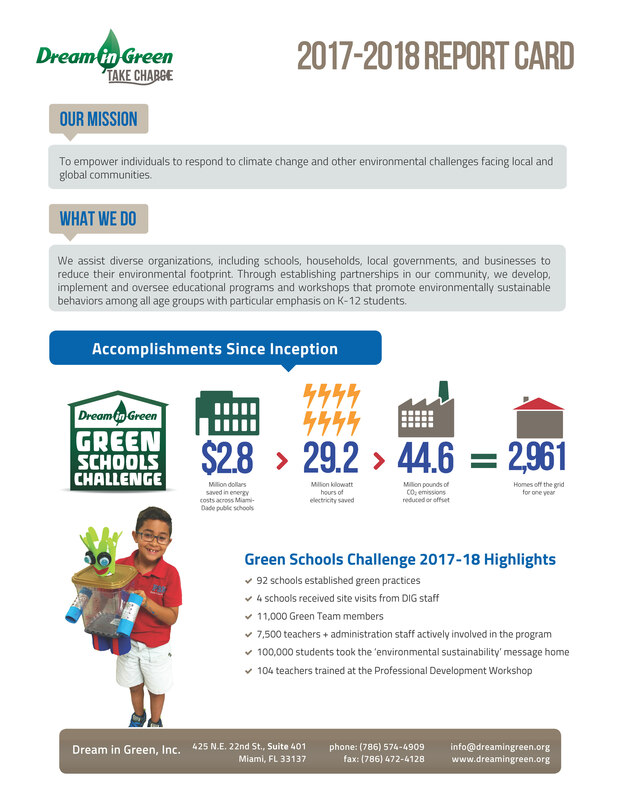 The report card summarizes Dream in Green’s impact through the Green Schools Challenge, Water & Energy Learning and Behavior (WE-LAB), and Green Leadership Grants programs. 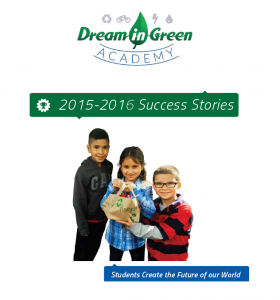 This booklet highlights Dream in Green’s winning schools and students’ accomplishments. With your involvement, you can help K-12 students understand the importance of environmental stewardship, reduce our carbon footprint, and ensure a more sustainable world that we can all thrive in. The projects they complete each month and the leadership skills they develop along the way, have a long-lasting impact at the school, in our community, and in their prospective professional careers. Nick Gunia, founder and past Chair of the Board of Directors for Dream in Green, explains his journey from the corporate dream to his “dream in green”, and how what appeared as a complex problem had a simple solution: children as the agents of change for a better, more sustainable world. Check out his TED Talk!